Please feel free to discuss the latest BT software update for T2100 & T2200 devices in this thread. This update contains Synopsis in Guide, the ability to launch the Action Panel from failed recordings, quicker playback bar timeout for recordings and clearer programme tiles. This update also contains a fix for an issue where audio wasn't playing on radio recordings. Any radio recordings which were previously not playing should now work without any issues once your box has updated. Still intrigued why BT don't think they can implement the iPlayer restart surely with BBC as a partner this should be a defacto addition??? A couple of useful changes but don't like what's been done to the guide so I'll not be taking this thanks. Welcome back Sarah, have you got your flak jacket on? What!!!!! Still no hide channels. Why is it proving so difficult to bring back? I have not read this in recent release notifications for other boxes. Do we know what has changed ? Please excuse me for asking, but is this supposed to be legible? I have not read this in recent release notifications for other boxes. Do we know what has changed"
They are the new EU primacy terms. Nonsense. That happened on April 23rd for all BT boxes. Oh, and I have corrected your attribution above, for the benefit of @Zulu17. And while EU primacy is a thing, I sort of wonder if perhaps you didn’t mean ‘privacy’? As for the formatting, we are currently looking in to why this has happened - and will have a fix asap. Thank you for bearing with us (and to @Roy for letting us know about the errors). Software page should be working on mobile now. Apologies for this! i hope you can help. Following the latest software update, the Netflix app on my UHD (G5) Box simply will not load. Not even the Netflix logo comes up. The screen goes black for one second then goes straight back to live tv with the channel number bar showing up. I have reset the box in mainitance mode without deleting recordings. I have checked my cables, internet connection and other on demand apps which all work fine. I believe it’s to do with the recent software update. Has anyone else had the same issue? Also so if it is an issue with the software will YouView be rectifying this soon with a fix? I do do not own a smart TV and use the box to it’s full potential. Just glad I have my amazon stick as a back up until the amazon prime app EVENTUALLY comes onto the G5 box. Though I believe a newer box will be realised before then! Sorry for the rant and thanks in advance. @DeanS I have the same box. Just checked, Netflix working OK. Agree though, BT software is a total farce. Machines seem to have different features according to which you have..
Because the hardware is different, and because the T4000 needs software support for UHD, not just the HD of the T2100. Only the zapper version of each box that has one, like the T2110, can march in lockstep with the given recording model. If they keep to timetable it should be here within three weeks. If they keep to timetable. There is still no iplayer restart thing that the retail box that my sister has. Where instead of pressing the red button then restarting the current BBC programme. You can restart the programme you are watching on the BBC channel with just one press of the Youview remote. What a disappointment! We lost so much with the Nextgen “upgrade” & were promised so much in return. Where is it & why is it ALL taking so long? We were told that this new platform was much more malleable & able to have changes made quickly, instead of waiting months. What have we got, a system where changes hardly ever happen & when they do, they are trivial. Where are the original features? Hate the change to the guide "Programme Synopsis in the Guide" makes scrolling through programs to see whats on a very unplesant ecperience! Dont usually use these forums but this really pis**s me off! I agree about the synopsis box in the guide. It is absolutely terrible and stops you smoothly navigating through the channels with the page down option. How anyone thought that was a good idea and how it got through UAT is beyond me. I would really like an option to disable it. If it was a feature which was commonly available across other devices I would agree more. Dodged a bullet on my 4000, it doesn't have this feature. And with the speed that BT works it never will! Yesssss! For once in my life I am winning! I feel sorry for you boys! Dodged a bullet on my 4000, it doesn't have this feature. "Dodged a bullet on my 4000, it doesn't have this feature. And with the speed that BT works it never will! Yesssss! For once in my life I am winning! I feel sorry for you boys!" This update was for T2100s & T2200s only. So as Roy said, if they don't get you now they'll get you later. Though the quicker playback bar timeout for recordings is a positive bonus. Other than backing out this update, how can I turn off the guide synopsis? If I want to find out more about a program I can use the info button, now the synopsis hides the program/s that come after. Really annoying!!!! 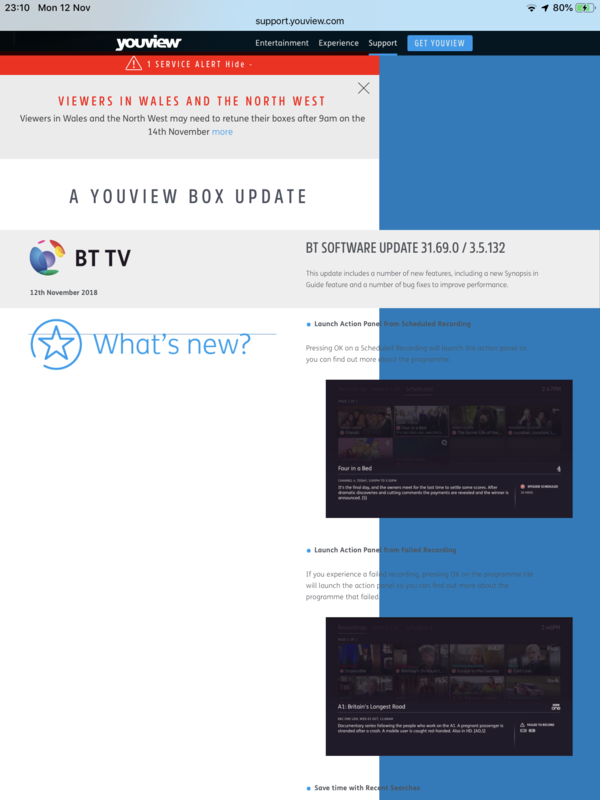 You can’t back out a YouView update, and you can’t turn off the guide synopsis. Unfortunately there are hardly any 'On / Off' settings in YouView, even though they have been called for for years.